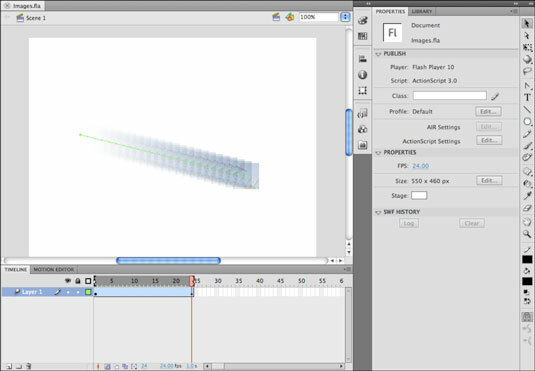 In Adobe Flash Creative Suite 5, any bitmap that’s been converted to a symbol can have motion tweens applied in exactly the same way as you would with any other Flash CS5 symbol. When you’re working with symbols created from images, you open up creative options, such as cinematic fades, moving slide shows, and unique presentation ideas. Drag an instance of a bitmap-based symbol to the stage from the Library panel on a new, empty layer. Position the symbol on the one side of the stage. For this example, we placed a symbol on the left side of the stage. The instance should be on Frame 1 of the new layer. Right-click (Windows) or Control-click (Mac) the first keyframe of the new layer and select Create Motion Tween from the contextual menu that appears. Position the symbol on the other side of the stage. Select the symbol once more and drag the playhead back to the beginning of the tween span at Frame 1. We moved the symbol to the right side of the stage. Using the Selection tool, click the symbol once to select it. Locate the Style drop-down list in the Color Effect section on the Property inspector, choose Alpha, and set the percentage to 0. The symbol is set to full transparency and disappears. To make sure the symbol returns to full opacity later, drag the playhead back to Frame 24 and use the Alpha slider in the Property inspector to return the symbol’s opacity to 100%. Press Enter or Return to play the animation. The image (symbol) appears to slide and fade in from the left side of the stage, shown here in Onion Skin view.